I’ve been hiking on the first 5 miles of the Red Cedar State Trail this past week. I managed to see some mink, a doe and two fawns as well as an Osprey. There continue to be a large number of flowers on the trail. There are more photos on my website. 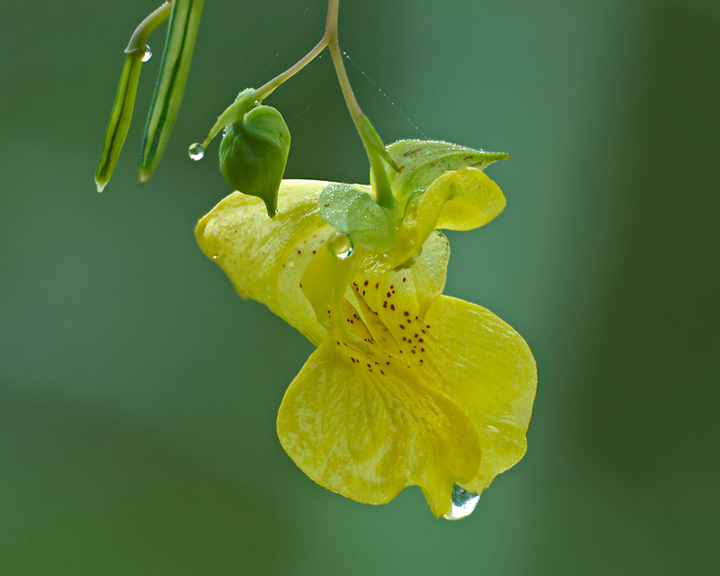 The most common flowers now are the Touch-me-nots both Pale and Spotted. This is a Pale Touch-me-not taken near Irvington. 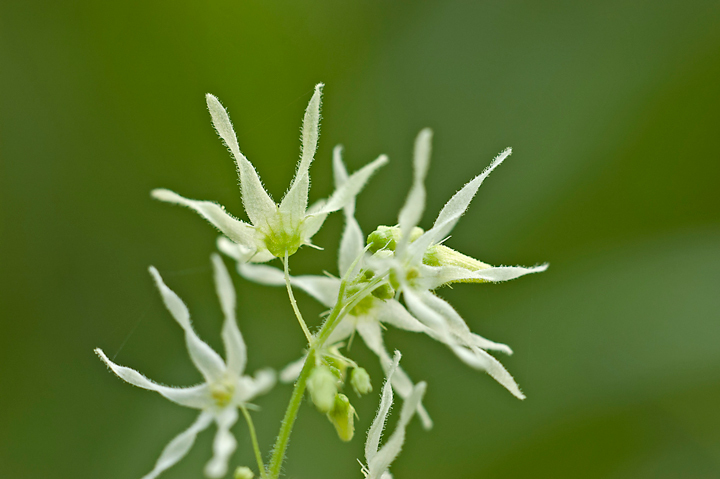 Another flower that is showing up along the trail is the Wild Cucumber. You will see vines along the trail with white flowers. These are in large groupings so they are hard to miss. A flower that I’ve photographed many times on the trail but could never figure out its name is also blooming. This year I finally figured out what it was when I found a photo of it when I was looking for another flower. 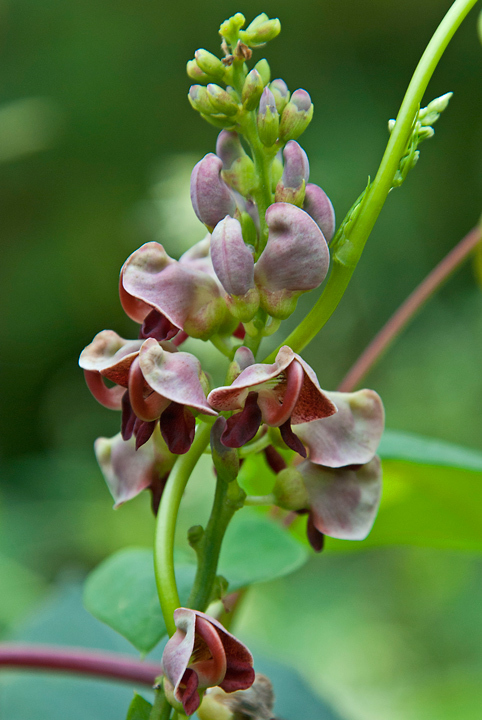 This is the Groundnut which can be found all along the trail although it is a little more difficult to see amongst the vines. 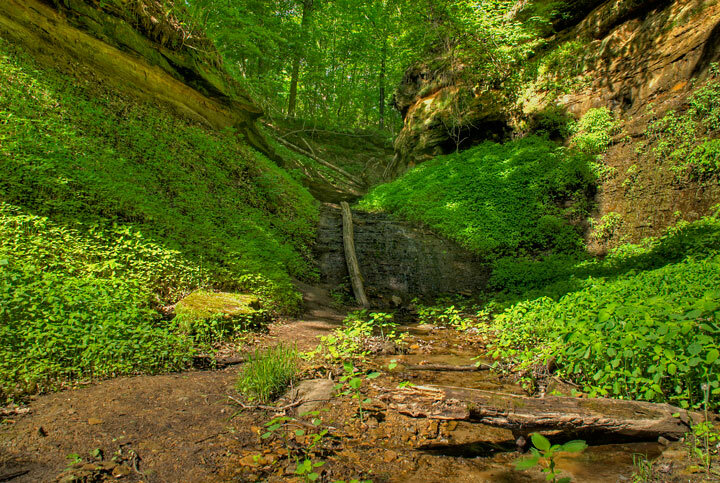 Paradise Valley is located just outside Menomonie, Wisconsin. It is very small with a spring fed stream flowing through the bottom of it. 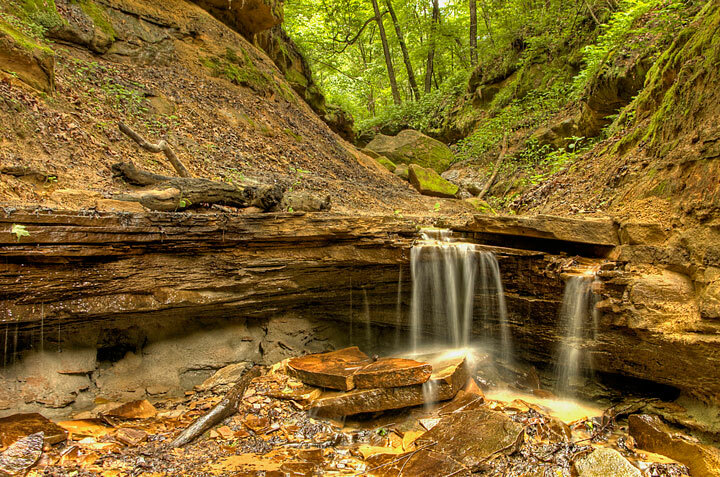 About 150 yards from the road there is a 15 foot waterfall that flows over some sandstone rocks. If you walk up alongside the falls you will encounter a second small waterfall that drops over a 3 foot sandstone ledge. If you can make it over the sandstone ledge, there used to be a ladder, the stream flows through some boulders and then fades out as it reaches the springs where water just seems to appear out of the ground. The sandstone rocks and walls are covered with moss and flowers this time of year. Last week’s heavy rains moved a lot of sand into the stream and removed a large log that used to lay along the left side of the first waterfall. The bottom of the stream is now almost all sand as opposed to a combination of sand and rocks. Directions and additional photos can be found on my website. 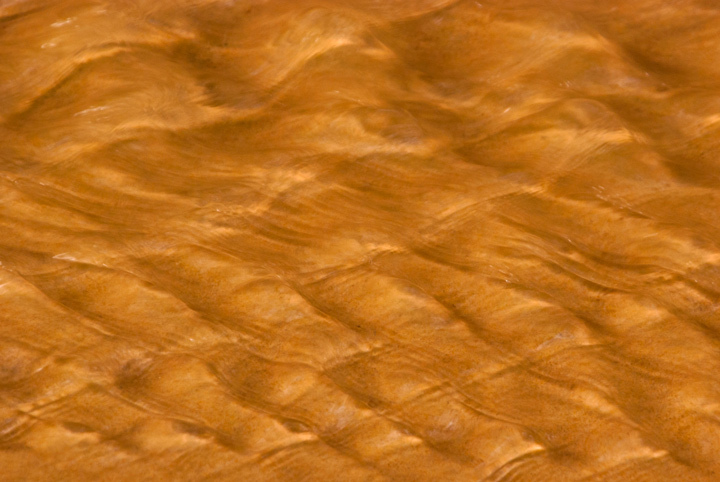 The first shot was taken this week and shows the ripples in the new sand bottom of the stream. This shot was taken last summer and shows the first waterfall with the large log on the left side. This is no longer there. This is a shot of the second waterfall with a view of the large boulders above the stream. As summer goes this has been a very good year for birds. 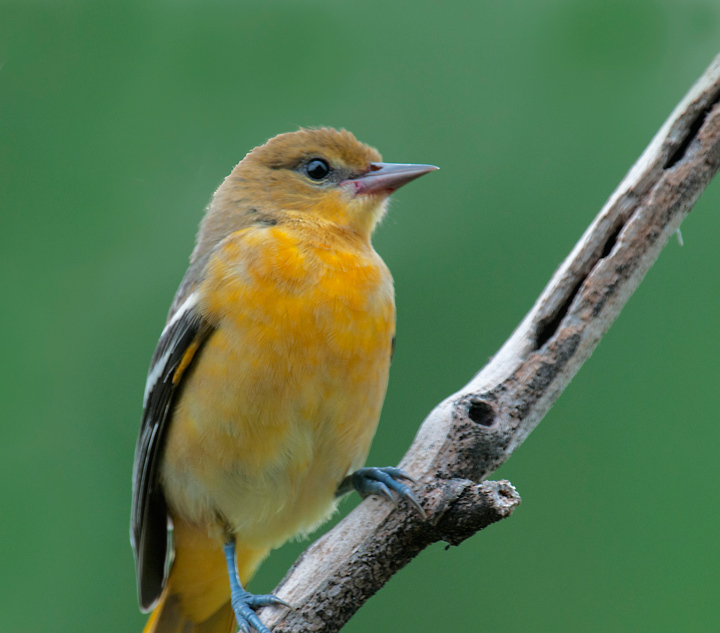 The first to arrive were the Eastern Bluebirds followed by the Rose Breasted Grosbeaks , Ruby-throated Hummingbirds and the Baltimore Orioles. The Eastern Bluebirds seemed to have a rough year. They apparently tried nesting in several houses and seemed to give up. They spend most of the summer hanging around the windows in my house. The female, in particular liked to perch on my window frame and look into the house. Late in the season they had a small brood. They were around until a few weeks ago. They left shortly after the kids fledged. The Rose Breasted Grosbeaks were also around most of the summer. I had more of them this year than in years past. 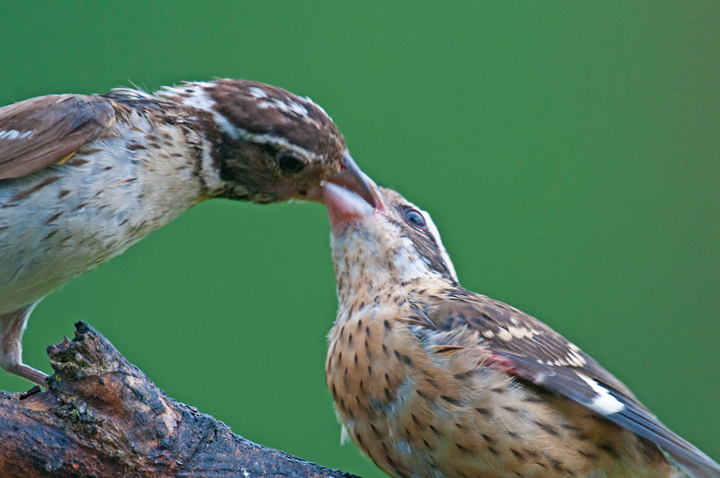 They also brought the young birds to the feeder and I was able to capture several shots of them feeding the young. You could always tell when the wanted to be fed because they seem to shutter and shake just before the parent showed up. I saw the last of them a few weeks ago. I have been presently surprised this summer by the Baltimore Orioles. They usually turn-up in the spring for a week or so and then disappear while they raise their young. Then they reappear after the young have fledged. Normally they don’t spend much time at the feeder but this year they returned and have been at the feeder for the last month. It may have helped that I used a new homemade feeder. I cut the bottom off of a pop bottle and drove a stick through it and then hung it from a pipe on the feeder. It has worked great except that I have to fill it every day. I have gone through almost a gallon of grape jelly so far this season. I suspect they will also be leaving shortly. More bird photos from the summer can be found on my website. Last Wednesday I reported on the post storm conditions in the wetland ponds. 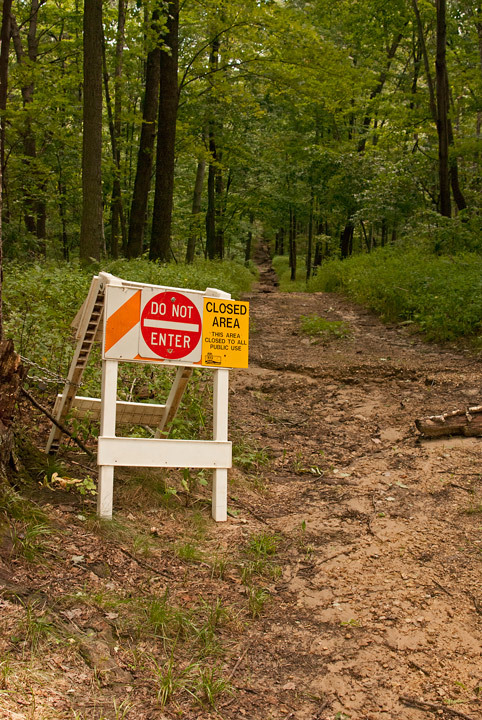 I feared that considerable damage had been done to the hiking and ski trails but the humidity was so high I didn’t want to walk into the woods. On Sunday we finally got some relief from the high humidity and my wife and I hiked some to the trails to the tower. As I suspected there was a lot of damage from Tuesdays storm. 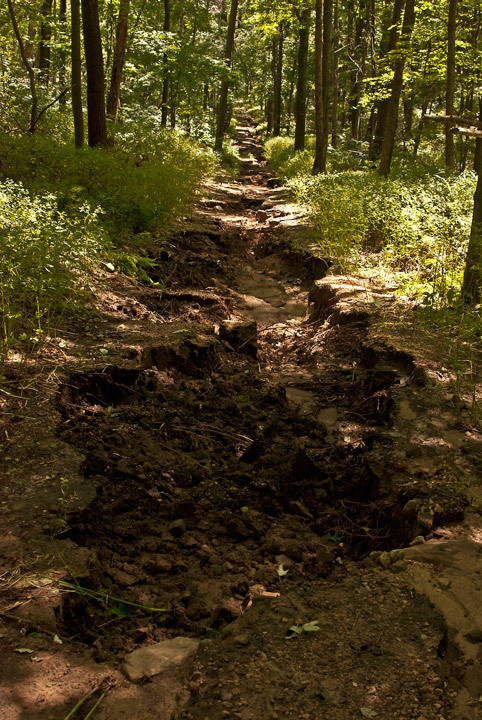 Many of the trails were seriously damaged and it uncertain when they will be repaired. One of the signs indicating the trail has been closed. This was my favorite cross country ski run on the east side of Hoffman Hills. There are more photos of the storm damage on my website. This spring I commented that the water levels in the two wetland ponds were the lowest I had ever seen them. Things changed dramatically overnight. We were deluged with rain on Tuesday evening. I had over 5 inches at my place in a few hours. The first pond is now full and the second pond was overflowing. 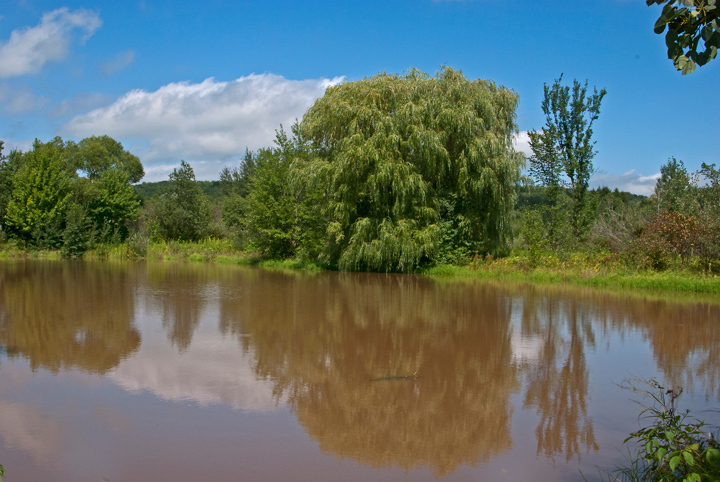 As the photos show a considerable amount of water came into the wetlands. 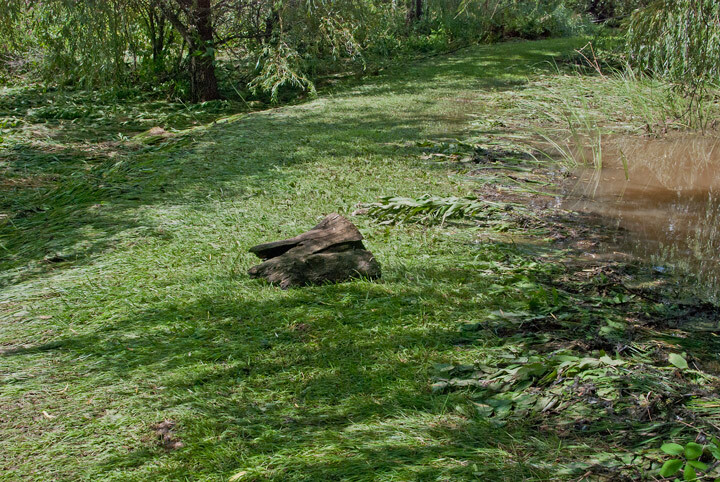 The dike around the first pond has been undermined in several spots so watch your step as you walk around the ponds. This photo shows the amount of water in the second pond. This photo shows where the second pond was overflowing the dyke into the wetland. Notice the size of the stump on the dike. This is a shot of where the dike was washing out. 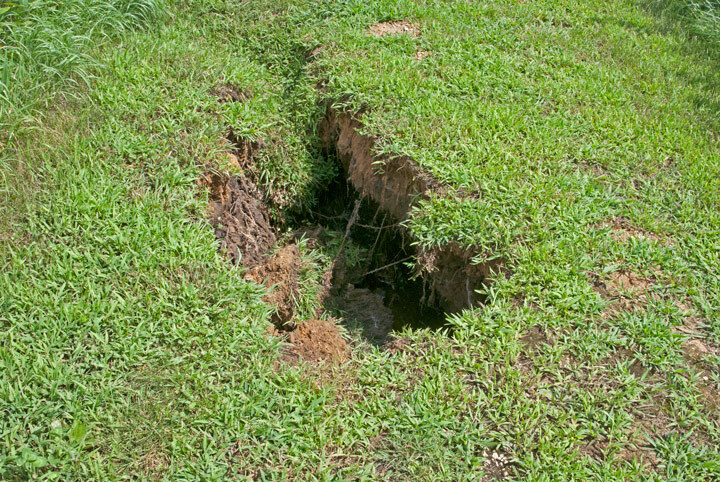 There was a small hole here caused by animals borrowing in the dike. Now it is a major hole. When I woke up to it there was a Green Heron feeding in the water running through the break. 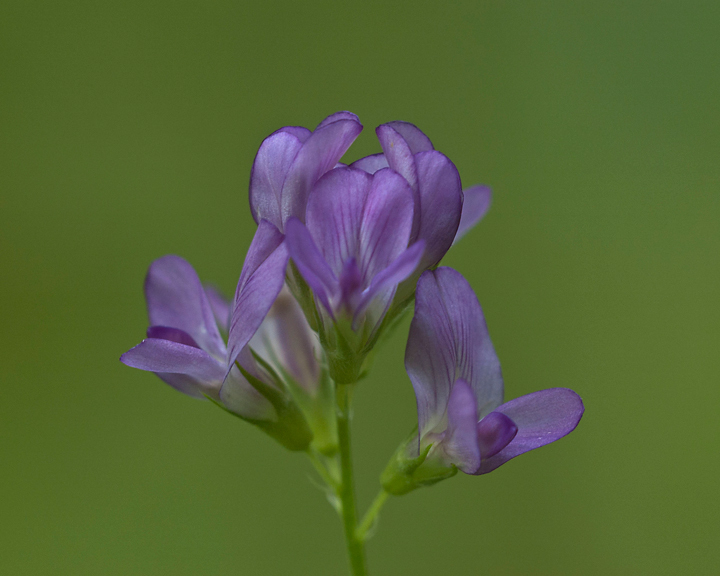 The heavy rains seem to have brought the peak wildflower boom to an end. There are still a variety of wildflowers around but the prairie is rapidly being overtaken by the Big Bluestem and Queen Anne’s Lace. We have been remodeling the house for the past couple of weeks so most of my photography has been limited to the farm. However, there are lots of interesting things to photograph. 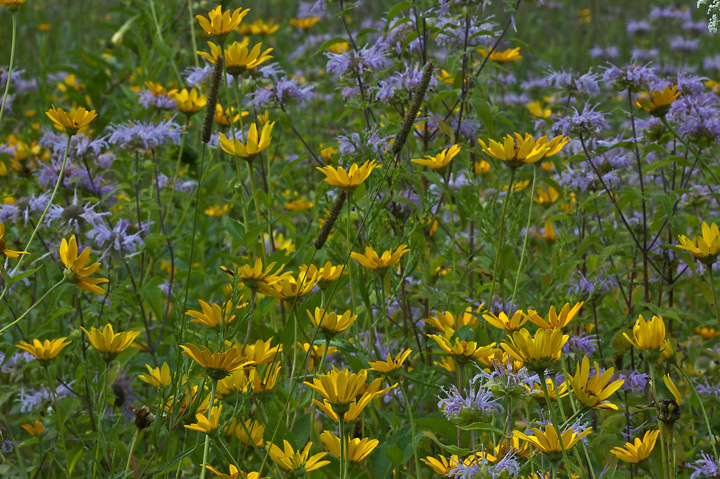 The prairie has quite a few wildflowers, Butter-and-eggs, Canadian Goldenrod, Evening Primrose, Purple Coneflowers, Wild Catnip, Black-eyed Susans, and my favorite Alfalfa. I like Alfalfa because, with judicious mowing, I can photography it from early June until frost. 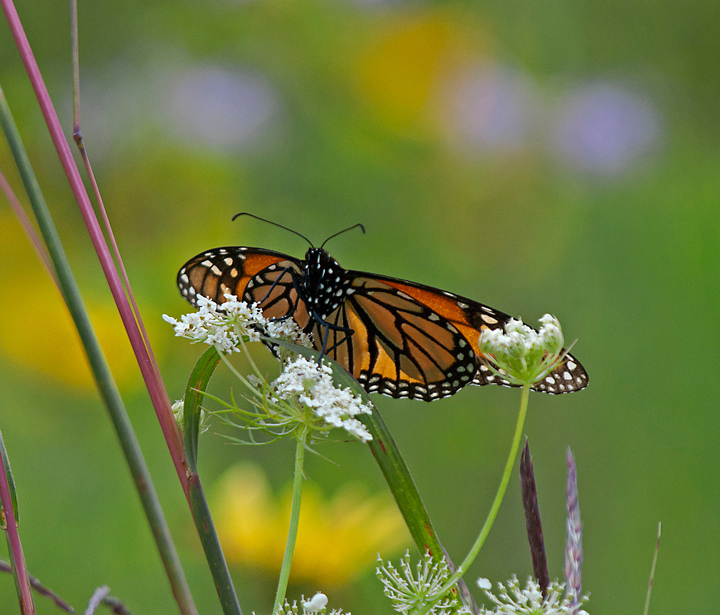 There are also an abundance of butterflies in the prairie. I have allowed a large number of milkweed plants to grow and I am seeing more Monarch Butterflies than I’ve seen in the past. 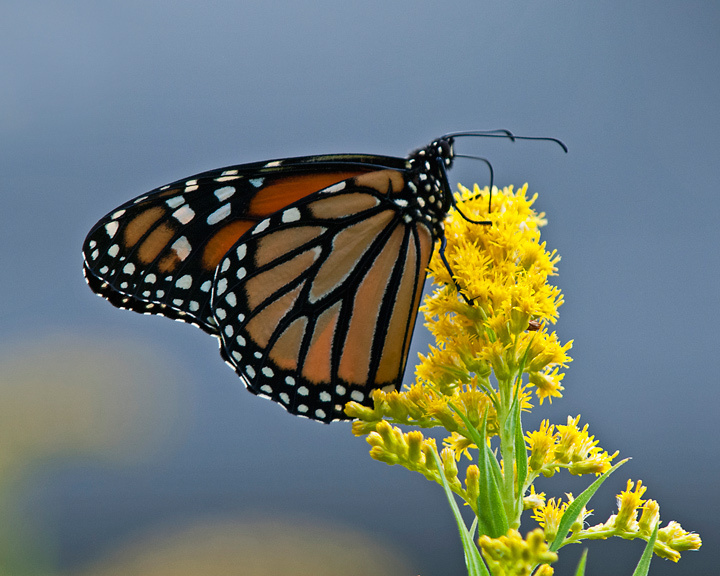 There are also sulphurs, Red Admirals, Great Spangled Fritillaries and a few others. Of course there are still summer birds around although some of them have already left. 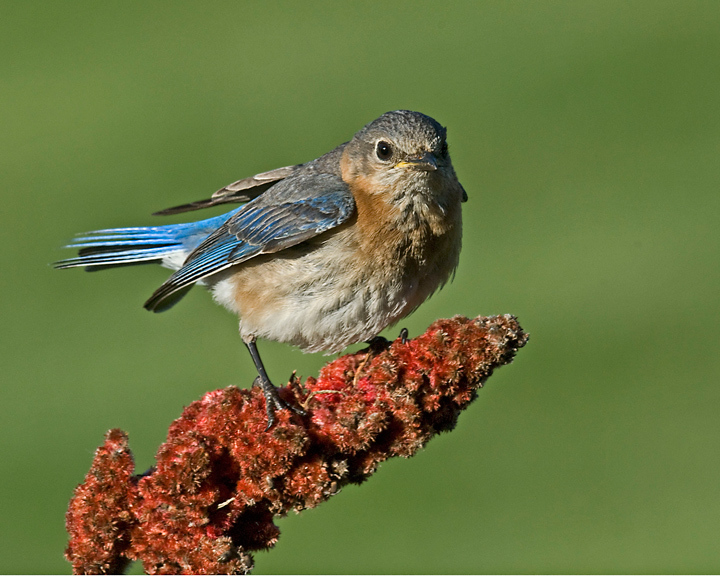 The Eastern Bluebirds and Red-breasted Grosbeaks are now gone for the season. 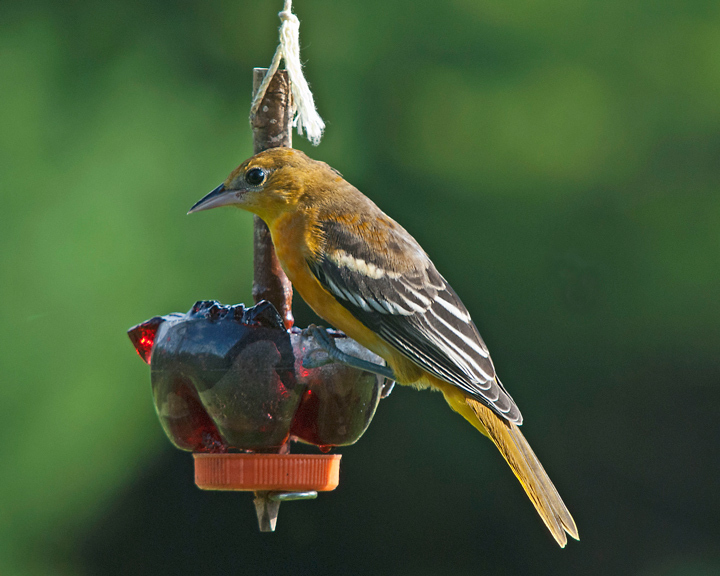 I have at least one family of Baltimore Orioles visiting the feeder. This is the first time they have stayed around longer than a couple of weeks. In the past month they have eaten over a gallon of grape jelly. I’ve noticed several other birds partaking of the jelly as well. I have quite a few House Finches and American Goldfinches visiting the feeder. 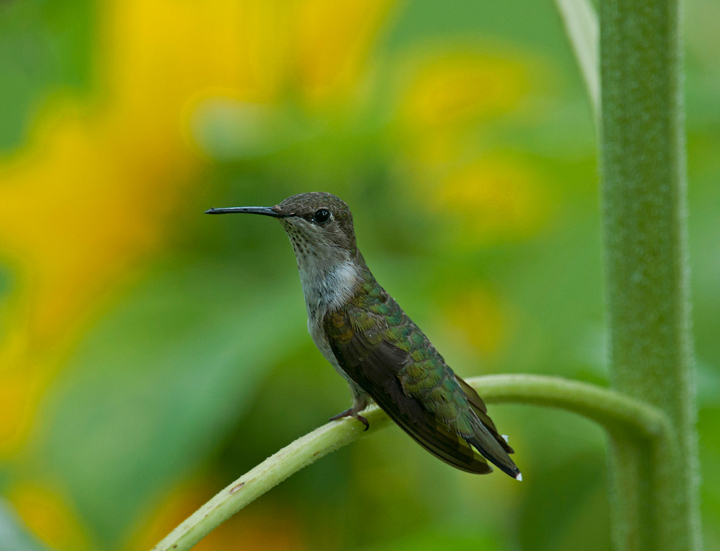 The Ruby Throated Hummingbirds are the most abundant birds at the feeders right now and they are going through about several gallons of sugar water every week. Goldfinches and the house finches have been feeding on some catnip that I planted. More shots from the last few weeks on the farm can be found on my website. Wildflowers continue to bloom in the prairie. In the area near the overflow parking lot there were quite a few butterflies and I was able to photograph one Hummingbird Moth. For whatever reason, I’ve seen very little wildlife in the ponds this summer. I haven’t been able to get out much the past few weeks. I have been fighting Lyme disease and this past week we have been doing a lot of remodeling on the house. The weather has been so hot and humid that it was more inviting in the air-conditioned house.